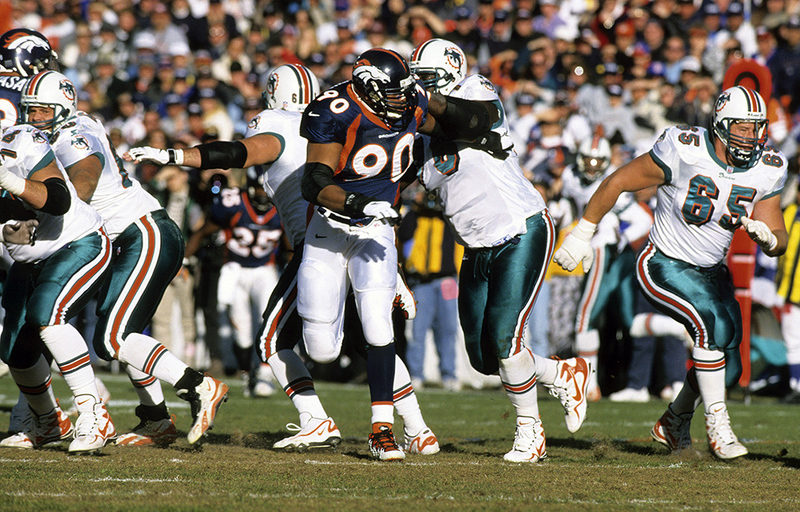 Denver Broncos defensive end Neil Smith (90) rushes the pocket during a 38 – 3 victory over the Miami Dolphins in the 1998 AFC Divisional Playoff Game on January 9, 1999 at Mile High Stadium in Denver, Colorado. Denver defeats Miami 38-3 in an AFC Divisional Playoff Game at Mile High Stadium to win its fifth consecutive postseason contest. It is Denver’s largest winning margin in the postseason, and the team sets postseason defensive records for rushing yards (14), rushing average (1.1) and points (3) allowed. Terrell Davis’ 199 rushing yards represent the fourth-highest single-game total in NFL postseason history.